Looking for a race ready street legal British bike with lots of cool upgrades for handling and power? Hey, me too. 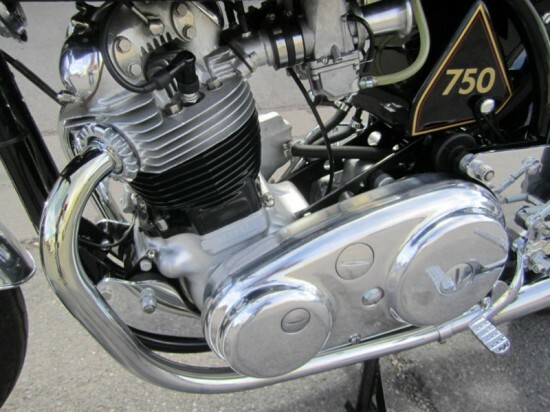 Have a soft spot for Norton engines sitting in Featherbed frames? Hey me too. Have lots of money to spend on a vintage bike that’s built the way you would have built it? Yeah, me neither. A guy can dream though. This is one of those bikes that always made me wonder something until I did it myself. For years I always wondered, why spend all the time, money and effort to build your dream bike to just turn around and sell it? Well, I built a very nice custom CB400f once, It took me a long time because I was short on budget and long on wants. Once I got it close to done I began to ride it. At some point I realized it would never really be “done” and so much time had passed I wanted something completely different now. I sold the bike for a fair price but still came out as little bit of a loss. Then I started building a KZ1000 but before that got done I started building a Ducati 250 bevel drive. Maybe that’s what happened here. Somebody has a custom frame built and spends countless hours scouring the internet for the perfect era correct parts and then puts together his dream bike only to find out its not his dream bike anymore. 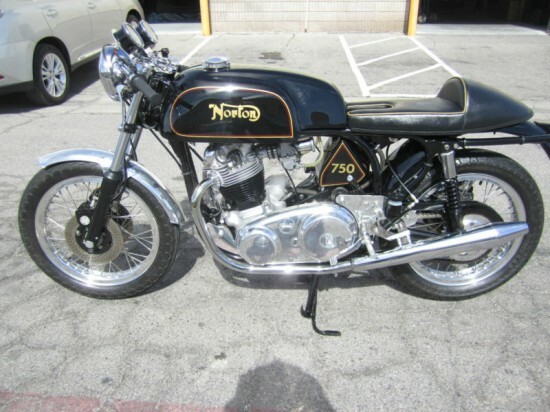 Anyway, the buyer of my CB400f got a neat cafe racer for half of what it would cost him to build one and you might be able to buy this Norton for half of what it would cost you to build it. Building motorcycles is nothing like I see on TV where parts magically show up at your door and fit together perfectly the first time. Engines rarely start on the first try. I also find there’s at least one purchase that you have second thoughts about and you spent to much on so it just goes on a shelf waiting to be repurposed someday. Who ever cleans my attic when I’m gone is gonna be stoked. Alright, I’ll get to the point. My point is, if you would like to fast forward threw all the headaches and bad purchases of building a bike buy this one. It’s done, and ready to ride. No crying over midnight eBay parts purchasing or nothing. Turn key and go ride. Here’s the sellers long list of stuff and things. FRESH- NORTON COMMANDO 750 SHORT STROKE IN A ISOLASTIC FEATHERBED FRAME, ONE OF A KIND, AND ALL PARTS ARE THE BEST OF THE BEST, BORRANI,BREMBO , GRIMICA, TOMMASELLI, DUNSTALL, GIRLING DUCATI CUSH DRIVE HUB AND SWINGARM ECT,ECT. EVERYTHING IS FRESHLY POLISHED,PAINTED, REBUILT ECT. 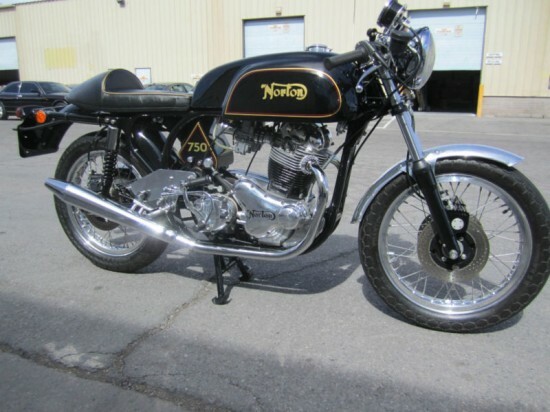 BIKE WAS BUILT BY THE BEST NORTON GUY IN THE BUSINESS. BELOW ARE THE SPECS, ON THE BIKE, ALSO INCLUDING A HALF FAIRING WHICH I WILL SEND PHOTOS IF SOMEONE IS VERY INTERESTED.THIS BIKE CAN BE VIEWED ANYTIME IN LAS VEGAS, ALSO FOR SALE LOCALLY AND MAY END AUCTION IF IT SELLS. GOOD LUCK BIDDING. 770CC SHORT STROKE, 78MM BORE X 80.5 MM STROKE WITH CUSTOM MADE TITANIUM RODS, ARAIS SLIPPER PISTONS, SPECIAL LITE STEEL FLYWHEEL, BALANCED BY LINDSKOG BALANCING IN FOXBOROUGH, MASS. (THEY DID ALL THE WORK FOR THE BUTLER AND SMITH BMW’S IN THE 70S AND 80S. CAM IS A NORRIS RADIUS LIFTER TYPE USING SPECIAL TAPPET BLOCKS INSERTED INTO BARRELL WHERE STOCK LIFTERS SIT. BLOCKS ARE MADE OF AMPCO 45 MATERIAL AND TAKE SPECIAL CUSTOM ONE PIECE LIFTERS TO FIT INTO BLOCKS MADE FROM P20 OR H13 TOOL STEEL (CAN’T REMEMBER WHICH TYPE MATERIAL) THEY HAVE STELLITTE WELDED TO BOTTOMS AND RADIUSED, NOT BRAZED ON PADS. CARBS ARE 36MM MK2 AMALS WITH CUSTOM MADE VELICITY STACK ON SPECIAL MADE STEEL MANIFLOWS. TOMMASELLI.QUICK THROTTLE. HAS CABLE OPERATED CHOKES FOR EASIER STARTING. HAS A NEW CLOSE RATIO 4 SPEED GEAR CLUSTER. HAS A QUAIFE GEARBOX SHELL WITH NEW BEARINGS. 20T SPROCKET. CLUTCH IS A NEW BARNETT. PRIMARY DRIVE IS BY CHAIN. HAS NEW BOYER IGNITION AND BOYER POWER BOX, FULL LIGHTING AND HORN. NORTON SLIMLINE FEATHERBED, MODIFIED TO ACCEPT AN ISOLASTIC CRADLE. ISOLATED CONCEPT IS THE SAME AS A COMMANDO. HAS A SPECIAL MADE CHROME-MOLY SWINGARM TO CLEAR SUB-FRAME. MADE LIKE A DUCATI AND SEELY OF THE 70’S. 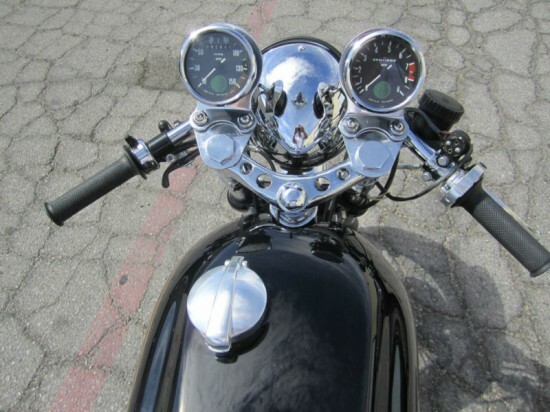 HAS A SPECIAL ISOLISTIC HEAD STEADY, LIKE A NORTON PRODUCTION RACER. FRONT DOUBLE DISC IS A DUNSTALL AND REAR WHEEL IS A TRIUMPH WITH A SPECIAL CUSH DRIVE. ALL DISCS ARE MATCHING IN SIZE AND SHAPE. LOTS OF STAINLESS THROUGHOUT. ALL THE FIBER GLASS WORK IS ONE OFF. EXHAUST IS SPECIAL TUCKIN TYPE WITH STOCK MUFFLERS, FOOTPEGS, BRAKE PEDAL AND SIDE PLATES ARE ALL SPECIAL MADE CLIP ONS ARE MOTO GUZZI LEMANS. Now, click, buy and ride.